Get 16 different tools in 1 compact kit for different usage in any situations. It practically covers everything you need in one simple set. It can be an emergency tool, you can saw wood, cut the rope curtain, and escape dangerous situations by breaking the glass. The compact design allows you to bring it practically anywhere. It's a must-have camping and fishing item, a multipurpose tool kit in your house to tighten the loose screw, etc., and simply a nice tool to have around in an emergency. Stay safe by taking our multi tool knife wherever you go! 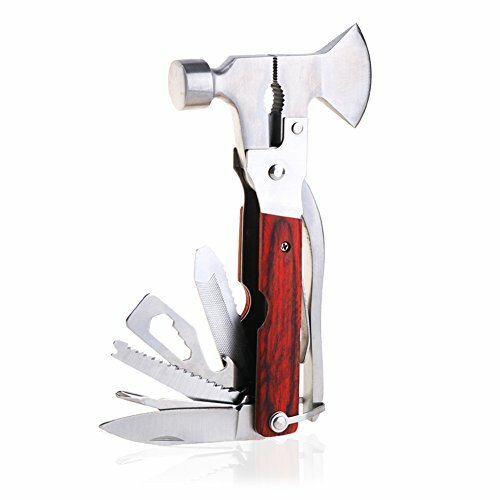 SUPERB VERSATILE MULTIFUNCTION TOOLS - This survival tool now comes with the ultimate multipurpose tool! It's a 16-in-1 kit consisting of pliers, Phillips screwdriver, double-sided knife, saw blade, knife, opener, screwdriver, cork opener, shears, ax, and hammer. Our multi tool is absolutely necessary for small repairs and projects! MILITARY GRADE STAINLESS STEEL & WOOD MATERIAL - This multitool pliers are made of the highest grade stainless steel material and smooth wooden for the handle, our survival kit is sturdy, anti-rust, stain proof, and can endure any weather. If this multipurpose tool not sturdy enough, feel free to return it to us and get your money back guarantee within 30 days! ERGONOMIC DESIGN FOR EASY HANDLING - This multitool knife set provides you a firm grip on the ergonomic design handle so it won't be a hassle to use and slip over your hand. Plus, it can be folded easily. These multi tools have a compact size: 6.3 x 3.5 x 1 inches. PERFECT FOR OUTDOOR & INDOOR ACTIVITIES - This multi tool can be used literally everywhere! Be it the workplace, camping site, as a tool kit in your house, to trim garden bush, or in an emergency situation to break a glass, etc. We also provide a handy pouch for easy storage, keeping it clean & protected! GRAB YOURS NOW! - Not only a nice tool to have around when you need a quick tool & do not want to lug out the tool box, it's also a perfect gift idea for your loved ones! Also, we have some offers for buy 3 get 10% off, buy 2 get 5% take this great offer before is over with click Add to Cart button above. Order this camping multi tool NOW! If you have any questions about this product by Prime Multi Tool Kit, contact us by completing and submitting the form below. If you are looking for a specif part number, please include it with your message.